Hosted by Pilgrimage of the Heart Yoga this FREE festival in celebration of the United Nations International Day of Yoga. 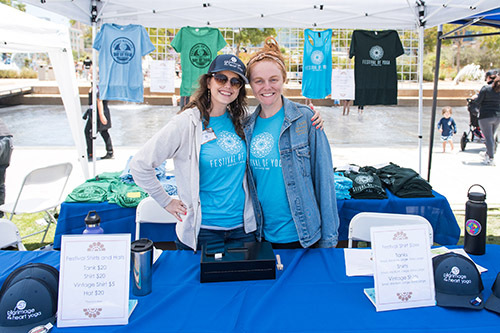 Sponsored by Pilgrimage of the Heart Yoga at San Diego's beautiful Waterfront Park. Bring along your friends and family for a great day of yoga & wellness in the Park! Available For 53 More Days! You will be assigned to a team and 2-hour time slot in the morning. You will be assigned to a team and 2-hour time slot mid-day. You will be assigned to a team and 2-hour time slot in the afternoon. Select the number of people in your group. You will be contacted for details. Volunteers (teams and individuals) are needed to help make The Festival of Yoga & Healthy Living a success. Below are some of the many volunteer opportunities. To learn more about volunteer opportunities, please email Andrea at Andrea@OGyoga.org or register to volunteer via the registration function at the top of this page.